- Sidechaining: use ducking to create more space in your mixes, or get creative with keying and pumping effects. NOTE: For help on how to get Presswerk sidechained in your DAW, please read these instructions compiled by our KVR forum members. - Adjustable compression curve and envelope. Find the best settings, get the most out of your audio using the soft knee, compression ratio, attack and release and other controls. - Loud. 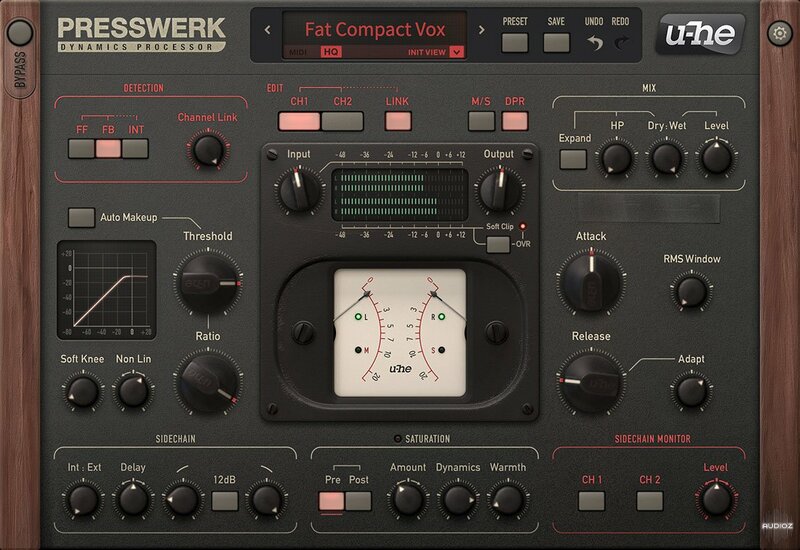 Oh yes, Presswerk is more than capable of making your tracks louder! - Soft clip. Roll off those harsh peaks and avoid distortion when output levels get too high. - 6 special views for better workflow: Drum Compressor, Vocal Compressor, M/S Program Compressor, Easy Compressor, Bus Compressor, Limiter (see the screen shots above). - Dual Phase Rotator (DPR): applies a radio broadcaster's trick to reduce unwanted asymmetries in the signal. It smears phases, increases headroom a little and adds bass 'oomph'. - Saturation. This is where Presswerk really shines—adding colour and character to your audio. - Apply Saturation sparingly for subtle warmth and transient-taming, or crank it up to create tape overdrive-like effects. - Internal parallel compression. The Mix controls let you blend the compressed and uncompressed signals. This helps preserve some of the original, natural dynamics. * Feed-forward is modern and 'surgical', it tracks the input very precisely. * Feed-back is 'musical', loose-sounding and forgiving—like classic hardware. * Interactive continuously analyzes the signal and blends FF and FB accordingly. Due to the new preset browser, it is important to install the update into the same location as the previous version, and to make sure to select all previously installed plugin formats during installation. Alternatively, you can remove the old installation, and start over with a fresh installation. But it is crucial to not mix old and new plugin versions, since the old versions can not cope with the new preset browser, and will crash (or otherwise misbehave) if you try to load them. One of the best compressors. All rounder catagory. I find it better than pro c2 and dc8c 3. Thanks so much for this. I uninstalled the previous version, but i have the preset browser problem described in the info. Anyone had the same problem? Any solution? I have Win 10, tested on Studio One 4.